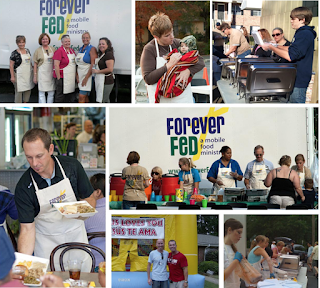 Forever Fed is a mobile ministry delivering food and fellowship to families who are under-served in Cherokee County. Forever Fed's Cans4Kids/Food4U program distributes boxes of food containing seven meals and seven snacks to each person in the household twice each month to families unable to access area food pantries for food support. These families lack transportation, are disabled, elderly, homeless, or part of the working class poor. Most are single parent households. Additionally, our practice is donating $10 for every new eyeglass frame sold from now until the end of the year. We hope to see you soon with some food!